In the quaint Klein Karoo hamlet of Caltizdorp, world famous for its fine wines, dried fruits and hospitality, there is a winding dirt road that leads one out of town and into the picturesque Groenfontein Valley. As the dirt road takes one ever deeper into Groenfontein, winding its way along the rambling Nel’s River and gently rolling hillsides covered in spekboom, aloes and all manner of Karoo succulents, you find a small sign post with a portly golden flying pig emblazoned on it and then you know you’ve found the place where dreams do come true, as you’ve found the Baylys and their secret patch of vines. 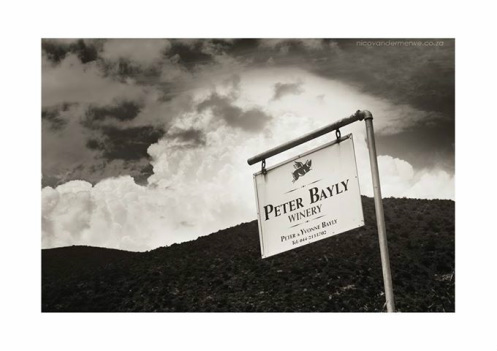 Peter and Yvonne Bayly headed into this secluded valley over a decade ago to fulfil their lifelong dream of crafting artisanal wines and “live free-range” in one of the most secluded areas of South Africa. At a bend in the river, with the majestic Swartberg as backdrop, lies a meticulously tended 1.2 hectares of Touriga Naçional, Tinta Barroca and Souzão planted in between shale and quartz. These Portuguese varietals were chosen by the Baylys in 2000, with the explicit aim of crafting the finest Cape Port and distinctive Klein Karoo red wines. With all this said, all one really needs to do is open a bottle of the Bayly’s fine Cape Vintage Port, scintillating Cape White Port or the groundbreaking red blend, simply named III, and then you’ll be able to taste that “dreams do come true”.